On my commute to work I very rarely stop for traffic lights, even when they are red I normally just cycle straight on past the queues of cars waiting at the stop line. I do this all perfectly legally and safely without breaking any rules. How can I do this? Because I cycle on an off road cycle path where these traffic lights do not apply. 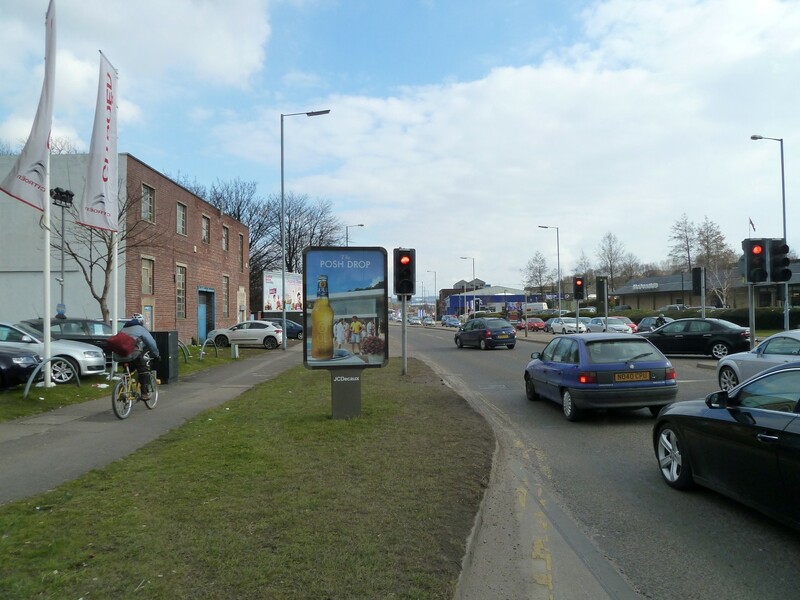 The traffic lights on Penistone Road in Sheffield do not apply to cyclists using the off road cycle path. There are 18 sets of traffic lights that I miss by choosing to cycle along this 1.5km stretch of Penistone road. Even if the lights are red I can pass them safely and am simply permitted to bypass them on the cycle path because the lights that apply to the adjacent road do not apply to the cycle path. This is a big big advantage that cyclists have over other vehicles, my journey is quicker, I don’t need to start and stop which makes cycling less strenuous, and I make excellent progress along this road. Don’t want to wait at the lights like the cars? Just use the two way cycle track and sail past. Lots has been said about cyclists being allowed to turn left on red lights, I do not support this because I think it will encourage cyclists to move up the inside of left turning traffic. However if cyclists are provided with dedicated off road facilities (as I use every day) then left turns and some straights simply do not need to be controlled by lights, cyclists are simply given a path through the junction without ever encountering a stop line. There are (almost) 5 sets of traffic lights controlling the road in this photo. A person using the cycle track checks that it’s safe to cross the side road and just goes. This convenience could be improved by providing cyclists with priority over other traffic when crossing the side road. 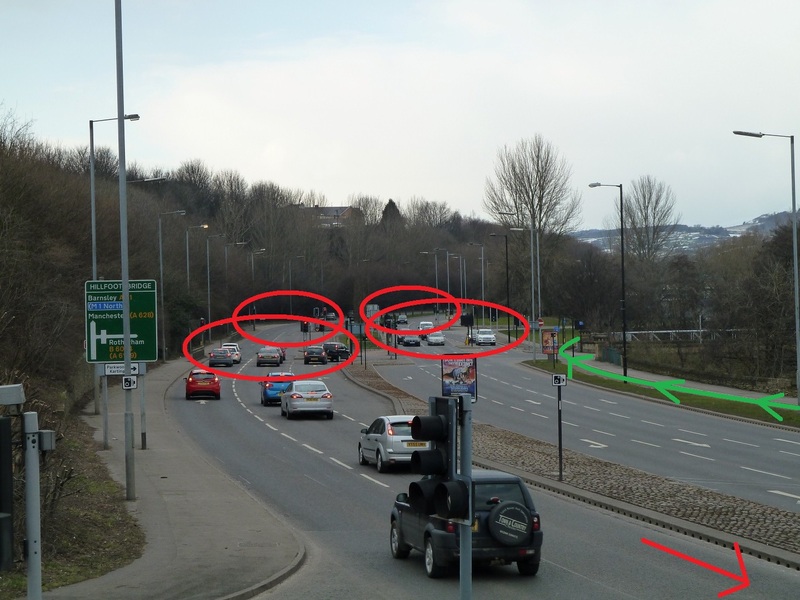 I’m glad that Sheffield City Council decided to ignore their policy of designing roads for confident cyclists only for Penistone Road because I use this cycle path every day, it feels safe and there are only two points where I sometimes need to wait. 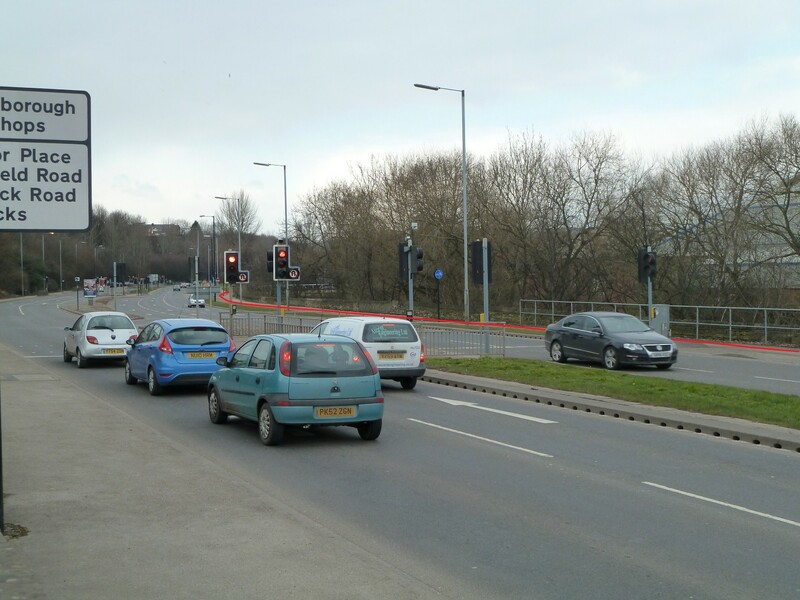 This entry was posted in infrastructure, Penistone Road on March 30, 2013 by Matt.